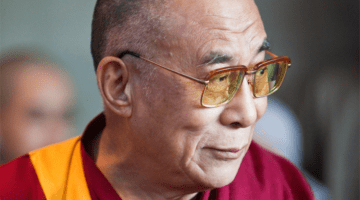 In this exclusive conversation, the Dalai Lama talks about human goodness, why the self doesn’t (and does) exist, and how caring for others is the ultimate source of your own happiness. 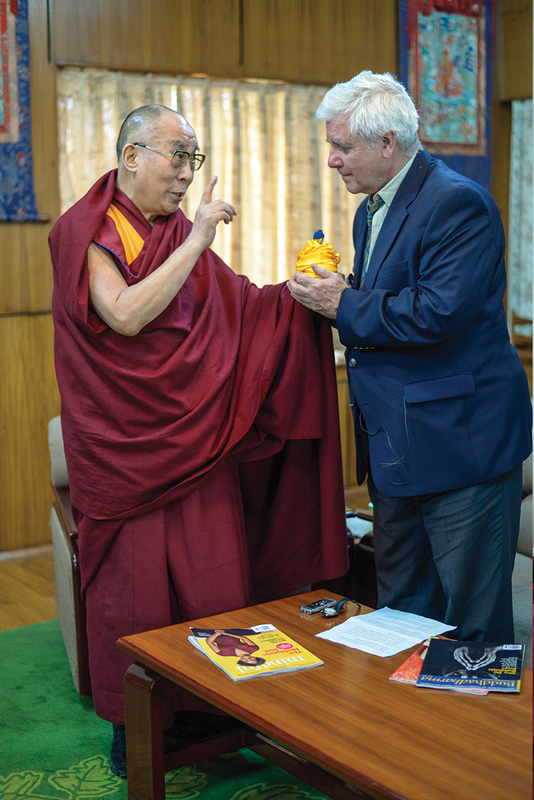 His Holiness the 14th Dalai Lama with Lion’s Roar editor-in-chief Melvin McLeod. Photo by Tenzin Choejor via DalaiLama.com. 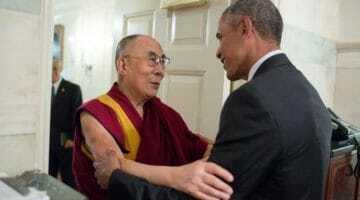 I think everyone who meets His Holiness the Dalai Lama comes away feeling they have been changed for the better. That was certainly true for me. 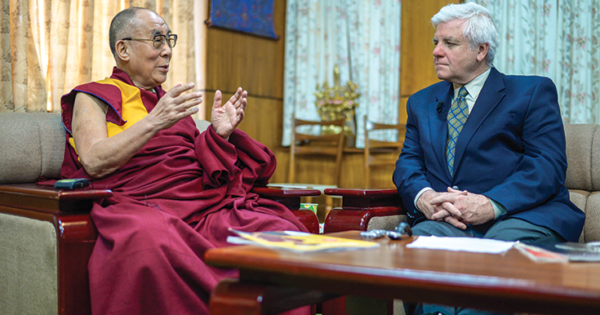 Spending an hour in his presence, talking about life, human nature, and Buddhism, was a life-changing experience. As I write this many weeks later, the glow has not worn off. Why does the Dalai Lama touch so many people, not just those he meets personally but the hundreds of millions around the world who are inspired by his message of wisdom and kindness? I think it’s because he sees past all our differences and connects with the essence of who we are as human beings. He opens our hearts and touches our deepest longing for a life of happiness and affection. He makes us feel it is possible. 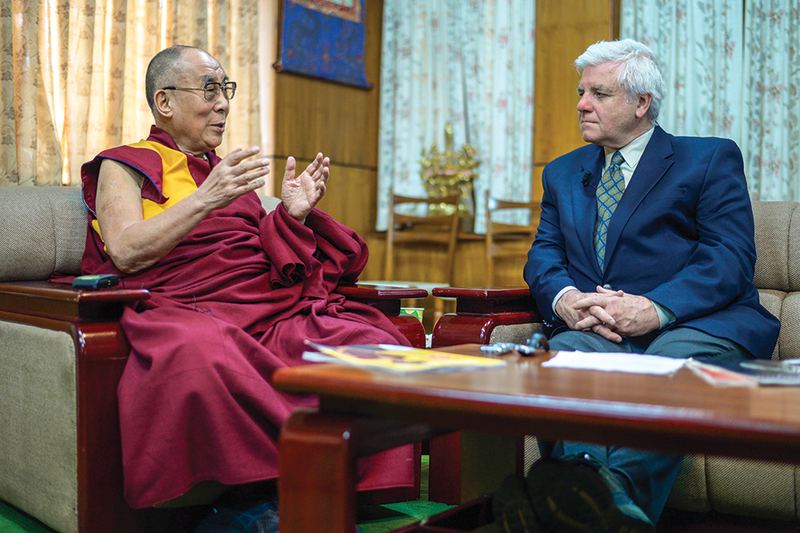 Before our interview, I watched His Holiness greet people in the courtyard outside. Young and old, Tibetan, Indian, and Westerner, well-off and poor, he opened his heart to everyone, and they to him. I witnessed too his deep connection with the Tibetan people, as he blessed a small group who had made the arduous journey from Tibet to meet their national and spiritual leader. As they wept, the Dalai Lama expressed his love and concern for them. It was deeply moving to see. I went inside for an hour of life-changing conversation. Your Holiness, on behalf of myself and our readers, thank you for sharing your wisdom with us. Many people in the West have been taught that they have to choose between their own happiness and the well-being of others. They are told that the correct moral choice is to sacrifice their own happiness. That conflict between our own happiness and other people’s doesn’t exist in Buddhism, which teaches that dharma practice simultaneously benefits both ourselves and others. How do you tell people that it is not selfish to be happy, and that they can care about—and benefit—both themselves and others? Photo by Tenzin Choejor via DalaiLama.com. There is no conflict, because caring about others’ well-being is the best way to achieve your own happiness. It may appear you are more concerned about others’ well-being than your own, but in reality you get the maximum benefit. The ultimate source of a happy mind and healthy body is your own mental attitude. Thinking only about yourself—having a very self-centered attitude—creates a lot of anxiety, loneliness, fear, and anger. This is very bad for your own peace of mind and for your health. Scientists say constant fear and anger do great damage to your immune system. We are social animals. An individual’s happy life depends on the rest of the community. An extreme self-centered attitude is the opposite of that. You prefer distance from other people because you are self-centered and feel you are something very important. Now let’s look at the other way—having a sense of concern for others’ well-being. That attitude is the opposite of self-centered narrow-mindedness. So logically, all the negative things that are created by a self-centered attitude are reduced when you care for others. Just look at how people smile. If we examine people who easily show a genuine human smile, we see they experience more peace. But when people have an artificial smile, I think it shows that inside they are a little bit distant from others. Children who receive maximum affection from their parents and friends are usually very happy. But if their parents show them a negative face, or punish them, they will be very unhappy. That’s human nature. There is no need for philosophy, no need for research. Everybody experiences that, right from the beginning of life. I often tell people that my first guru who taught me about compassion was my mother. If my mother had not been an affectionate person, then maybe I would be a different kind of person, suspicious and insecure. Fortunately, my mother was very, very compassionate, so I received maximum affection and benefit from her. It’s the same for all human beings. Therefore, the conclusion is that affection and concern for others’ well-being is the best way to achieve your own happy life, healthy body, and longer life. You don’t need drugs or tranquilizers if you keep more affection in your heart. I have practiced that and I’ve found immense benefit to myself. Many people, particularly in the West, doubt their own goodness. But Buddhism says we all have buddhanature and that human nature is fundamentally good and loving. How do you convince people—in the face of all the suffering and injustice in the world and their own problems—that they are basically good? We just need to look at children, smiling and playful. They never consider differences like religious faith or family background. Then gradually, as they grow up, they become more and more concerned about differences of nationality, religion, class. These are secondary differences, I feel. Actually, the seven billion human beings on this planet are fundamentally the same as human beings—we all want affection and happiness. Basic human nature is compassionate and gentle. On that level, the seven billion human beings are the same. We are all brothers and sisters. Some scientists did an experiment in which they showed cartoons to young children. When they watched cartoons of other children playing together and helping each other, they were very happy. But when they saw a cartoon of people harming each other, they were unhappy and withdrawn. These children were just two or three years old. Some scientists say this shows that basic human nature is compassionate and gentle. So I think on that fundamental level, the seven billion human beings are all the same. We are basically brothers and sisters. Then on the secondary level, yes, there are differences—different races, countries, systems, religions. There are too many differences. I think all our man-made problems are actually based on this secondary level of difference. But if you go deeper—to the fundamental human level—there is no demarcation, no barrier. We are the same human being. Everybody is born from a mother and grows up needing human affection. Same! I think the existing educational system does not offer adequate explanation of basic human values. Usually when we talk about values, they’re presented in the context of religious faith. But we can talk about human values without touching religion. We can simply talk about parental love, biological factors, and the fact that we are social animals. In this way we can educate people about human values. When children are very young, these basic human values of affection and compassion are very fresh. Then they go to school, where there’s not much talk about these things. I think the existing education system is very much oriented toward money and material values. Generations of people go through that kind of education, and gradually their life becomes more materialistic. Then, when values are discussed, it’s in the context of religious faith—almost forcing yourself to try to practice compassion or forgiveness. I think this is all due to the lack of understanding of what we basically need as human beings, which is affection and compassion. Education can’t focus only on developing our wonderful brain. We also need warm-heartedness. This is my view. Is it truly possible to be compassionate or empathetic without some understanding of non-self? In addition to teachings on compassion, how important is it to also present the wisdom teachings of no-self, or at least less self? Among the world’s different religions, there are theistic and nontheistic traditions. In theistic religions, their method is to believe in God, Creator, Infinite Love. That is their method to increase the practice of love. We are created by a wonderful, compassionate, infinitely loving God, which brings us some kind of enthusiasm or courage. Since such a God created us, we have the same spark of love in us. This is a very powerful approach. In the nontheistic religions, the emphasis is more on yourself. In nontheistic religions, there is no God or Creator. You yourself are the creator. So all the good or negative things that happen are your responsibility. As the Buddha stated, you are your own master. Now, you mentioned no-self, or less self. [Laughs] If you really want to develop an altruistic attitude, and in order to do that minimize self-centered feeling, you need a sense of strong self! We need to understand how Buddhism defines no-self. Buddhism says we have no soul. No-self means we do not have a self that is independent, singular, and permanent. That kind of self is not there. That is what Buddhists mean when we talk about no-self. In the Buddhist view; all negative emotions like anger and attachment are related to the false view that deep inside us there is an ‘I’ that is solid and independent. But this does not mean denying the existence of self. Self is there. Nobody can deny that. [Laughs] So as I mentioned earlier, when you try to improve yourself, when you try to minimize destructive emotions, you need a sense of strong self. You need to feel, “I can do it. I can change my mind. I can reduce anger, hatred, and distance from others.” For that, you need a strong sense of self. But not in the sense of a permanent soul or self. Independent, unchanging self is not there. If you don’t accept that, then there is no possibility to change and improve yourself. In the Buddhist view, all negative emotions like anger and attachment are related to the false view that deep inside us there is an “I” that is solid and independent. When we realize we do not have that kind of independent, singular, permanent self, it reduces the strength of those destructive emotions. Because we feel we have an independent self, something very solid, we believe the objects of our anger or attachment are also absolute and independent. We do not see them as relative, as dependent on other factors. The negativity of your enemy seems like something absolute, something independent, and anger develops. Once you realize that, you can reduce the conditions that create your enemy. You can see that you are also a contributor to the situation due to your attitude. You realize, “Oh, this person is also angry at me because I contributed to creating this situation.” So you can’t blame everything on them. That reduces the anger. I read a simple statement the other day that I thought was the best summary of Buddhist practice I’ve seen. It was simply: Buddhism is cultivating awareness of your mind. What is your basic definition of the Buddhist path? I express the Buddhist way of practice as utilizing human intelligence to the maximum, and in that way transforming our destructive emotions. Like other religions, Buddhism stresses the importance of faith, but faith must be combined with wisdom. Similarly, love and compassion also must combine with wisdom. In Buddhism, and particularly in the Nalanda tradition I come from, intelligence or reasoning is very important. The Buddha was a great philosopher and thinker, and also a scientist. He told his followers that they should not accept his teachings out of faith, but rather through thorough investigation and experiment. So in the Buddhist tradition, investigation, reasoning, and evidence are the key factors. That in turn brings faith. Many years ago, I said to a Western Buddhist friend that I wanted to have more serious discussion with scientists. My friend said, be careful, science is the killer of religion. Then I reflected on the Buddha’s quotation—that one should not accept any sort of teaching just out of faith or respect, but through thorough investigation. Science is a method to try to know reality. Scientists are like many ancient Buddhist scholars, like Nagarjuna. They investigate! Western science has generally focused on studying the material, physical world, not mind. But now, in the later part of the twentieth century, emotions and consciousness are gradually becoming the subject of science. We must even investigate the Buddha’s own teachings. The Buddha may have said something in certain texts, but we cannot accept it if it goes against the scientific evidence. There are a growing number of people in the West who are doing mindfulness meditation not as a spiritual practice but because it has concrete benefits for their lives and our society. Many of the techniques are derived from or similar to Buddhist meditation. As perhaps the world’s best-known Buddhist teacher, what do you think of the secular mindfulness movement? Buddhists in general, and particularly we followers of the Mahayana path, pray for the happiness of all sentient beings. If you have genuine concern for the well-being of others, then there’s no way you will exploit them, bully them, or cheat them, because you care seriously about their well-being. Generally speaking, this sense of concern for others’ well-being means love or affection. There are now at least seven billion human beings on this planet, and we are connected—directly or indirectly—with them. Our future depends on the well-being of all seven billion human beings, and if we have some way to make a contribution to the well-being of humanity, we should do it. Out of the seven billion human beings, about six billion are religious believers and about one billion are nonbelievers. Meditation comes out of the religious tradition, but if people find it helpful to use it in a secular way, that is very good. It is like yoga, which also comes from a religious tradition but is now used to improve health. Mindfulness meditation sharpens the mind and increases your ability to investigate. That’s actually very useful. I think it is very good. I want to conclude by asking you about your global popularity. I think you may be the most positively viewed person in the entire world. What is it about your teachings or personality that literally billions of people respond to? When I meet people or give teachings, I always emphasize that we are all the same as human beings. Perhaps I have had difficulties in my life, and so I may have some experience that could be useful to others. Otherwise, we are the same. 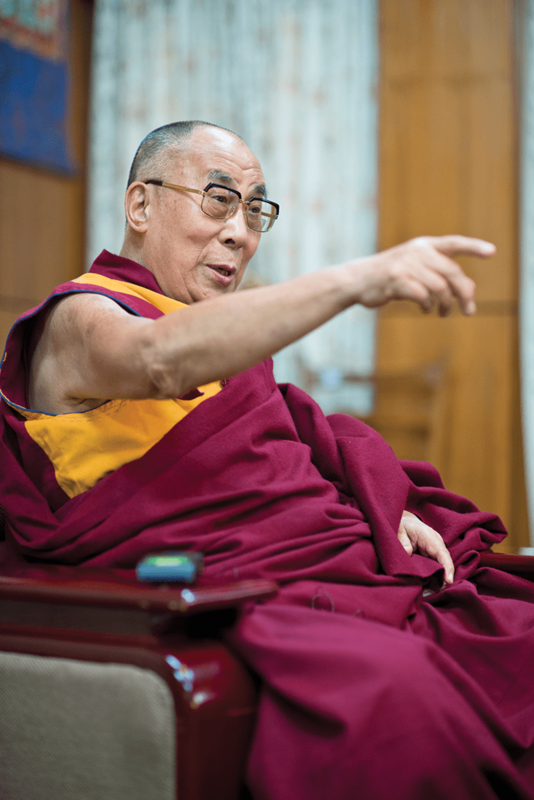 When I give teachings I never emphasize that I’m something special, that I’m the Dalai Lama. When I give a public talk, I never consider that I’m a Buddhist. No. Same. We are same human being. So immediately that brings us closer. If I stress that I am a special person—I say, “I’m the Fourteenth Dalai Lama [laughs]—that automatically creates distance. If I pretend I am something very special, that is fooling myself. Sometimes among Tibetan people there is a little bit of formality toward me. That I don’t like. Whether we accept a religious faith or not is up to the individual. But once you follow a tradition, then you should be serious and sincere. Your Holiness, do you have a final message for us? Whether we accept a religious faith or not is up to the individual. But once we accept a spiritual tradition—any spiritual tradition—then we should be serious. We should be sincere and without too much expectation. You see, you should follow the spiritual path with will and determination. Then, gradually, you will have deeper and deeper experiences. Mental development takes time—it is not like a machine. It takes weeks, months, years, decades. So please, spiritual brothers and sisters, once you follow any tradition, then you should be serious and sincere. Thank you.